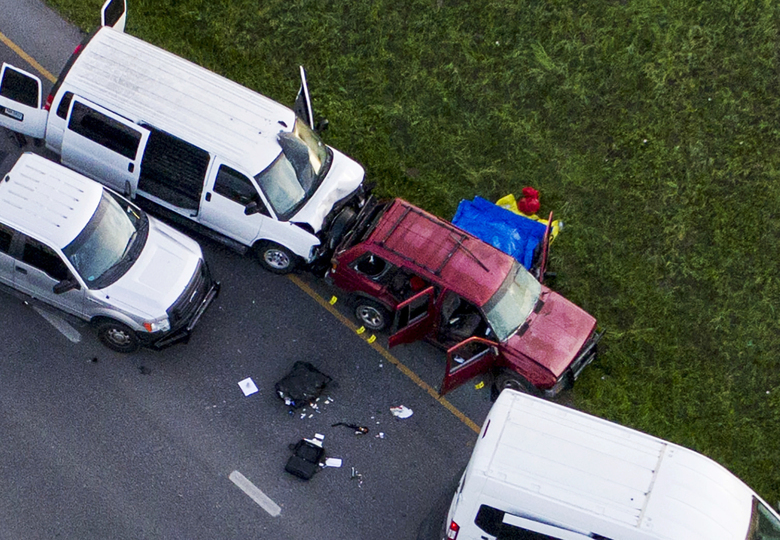 THE suspected bomber whose deadly explosives terrorized Austin for three weeks is dead. Mark Anthony Conditt used one of his own devices to blow himself up. But police warned that he could have planted more bombs before his death, and they cautioned the city to stay on guard. Conditt, an unemployed college dropout, was tracked down using store surveillance video, cellphone signals and witness accounts of a customer shipping packages in a disguise that included a blond wig and gloves. His motive remained a mystery. Police finally found the 23-year-old early Wednesday at a hotel in a suburb north of Austin known as the scene for filming portions of “Friday Night Lights.” Officers prepared to move in for an arrest. When the suspect’s sport utility vehicle began to drive away, they followed. Conditt ran into a ditch on the side of the road, and SWAT officers approached, banging on his window. Within seconds, the suspect had detonated a bomb inside his vehicle, blasting the officers backward. One officer then fired his weapon at Conditt, Austin Police Chief Brian Manley said.